I just roasted cauliflower last night, in the middle of summer, and it was so delicious. I think I avoid roasting vegetables in the summer in favor of the grill or eating vegetables raw. 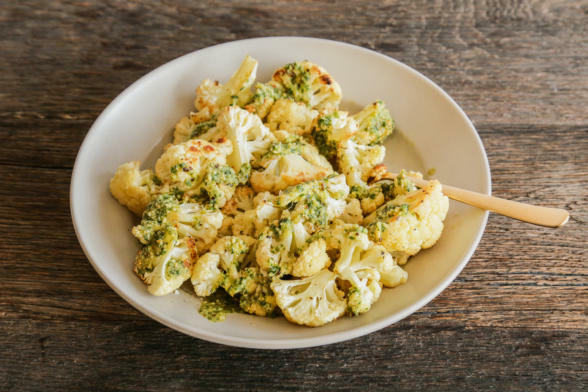 But it’s hard to beat the ease and flavor of roasted vegetables, especially cauliflower which is a vegetable I eat all year round. I might go out on a limb and say cauliflower is my favorite vegetable. 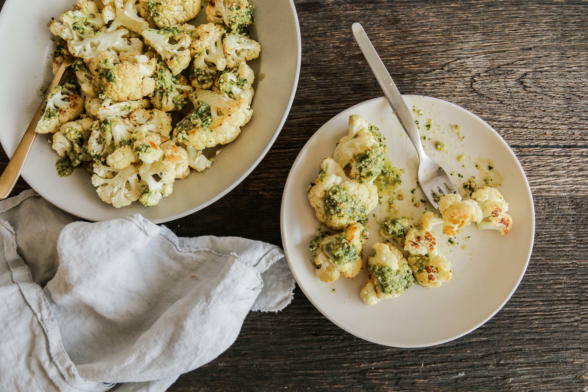 But this recipe is not really about the cauliflower in as much as it is a vehicle for this delicious, finger-licking-good almond-herb sauce. Technically this sauce has a bit of anchovy in it, but if I used the word anchovy in the recipe title, 83% of you wouldn’t even look at it. In all honesty, my father used to put anchovies in the garlic and oil intended for pasta, and I refused to try it. Eeeeew. But, oh what I missed out on all those years. Anchovies are little umami flavor bombs. They’re a little secret ingredient that many chefs keep in their back pockets (not literally, of course.) What’s great about anchovies is that they elevate and deepen the flavor of a dish but they don’t taste fishy, in my opinion. Anchovies can be found fresh, but I am referring here to the canned anchovy filets or anchovy paste. I use anchovy paste which comes in a toothpaste-like tube that you’ll find next to the cans of tuna and salmon at the grocery store. It’s exactly what it sounds like: anchovies, salt, and olive oil, ground into a paste. It’s actually pretty easy to make your own. Take a jar of anchovies packed in oil (not salt), and mash them together with a little salt and olive oil in a bowl using the back of a fork. You may not know that you have eaten anchovies, but they are in worcestershire sauce and a classic Caesar salad dressing, for example. For those of you who cannot eat anchovies, I would recommend substituting capers to mimic the briny flavor. I have eaten this sauce on other vegetables like zucchini (grilled, roasted or raw) and green beans (blanched), as well as pasta mixed with vegetables. I could even see it on a cheeseboard with some crostini. The sauce keeps well in the fridge for a week, although it solidifies after a few days. But in this summer heat, just leave it on the countertop for 10 minutes and it will likely come to a non-solid state. I’ve made this a few times for friends and everyone was scraping the bowl/platter with their fingers. It’s one of those all-purpose sauces that I will be making regularly for years to come, but I decided to post it now because, like me, many of you entertain and cook more in the summertime. Which reminds me, I need to start getting my daily meal plans organized for my week at my parents’ house with my sisters and their families! I love seeing your creations, so please tag me @pamelasalzman #pamelasalzman so I can check them out! If you are interested in my cooking classes, but can’t see me in person, you can join me in my kitchen online for a fraction of the price of an in-person class! See this link for details. 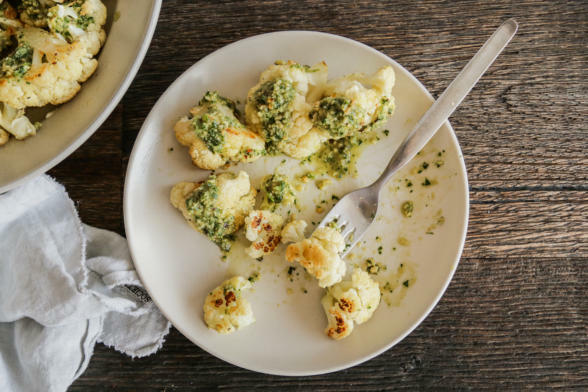 Place the cauliflower on the baking sheet and drizzle with olive oil and use your hands to rub over the cauliflower until evenly coated. Sprinkle with salt. Roast for 30-35 minutes, or until caramelized and tender. Meanwhile, make the sauce: In a small skillet, toast nuts over low heat, stirring often, until golden and fragrant. Set aside to cool. In a food processor, combine almonds, anchovies, garlic and butter and pulse until smooth. Add the oil, vinegar, herbs and red pepper flakes, if using. Season to taste with salt and pepper. Set aside. Serve cauliflower warm or room temperature on a platter or shallow bowl and spoon sauce over florets. Yes, it would still be good. I do prefer it with the butter, but it’s still good without. Oh my goodness! This sauce!! It was so good! My husband wasn’t too sure about it until he tasted it on the cauliflower and then he really liked it. I put the 1/2 teaspoon of red pepper flakes in it and it was not too spicy at all. I did use the capers because I had them. We had the cauliflower with the White Bean and Farro Salad. I thoroughly enjoyed my dinner tonight. Everyone else did too. 🙂 Thank you! I know, my kids weren’t too sure about it either and they LOVED it! If you have any leftover, you’ll find a way to enjoy it! How long can i keep That amazing sauce in fridge? 🙂 At least a week! I’m excited to try this sauce! Of the herbs you mentioned is there one that you thinks complements this sauce the best? It really depends on what you like. I have tried all the herbs listed and combinations, as well. I love mint and parsley, and cilantro and parsley. 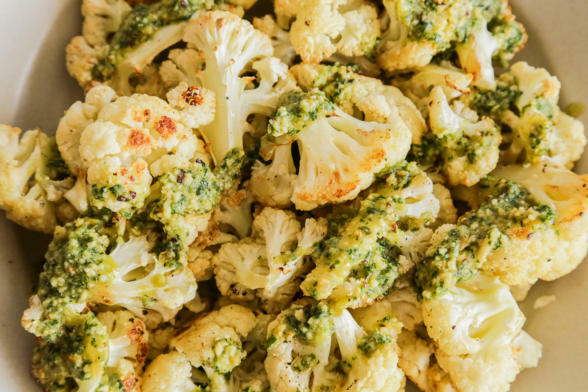 Roasted cauliflower is my favorite dish! Thank you for this recipe! Sounds delicious!